Yesterday I was lamenting the fact that whenever I say I am a vegetarian, I always somehow end up offending someone. The responses I get range from, 'You are missing out on so much," and "Plants have feelings too," (do they?) to "I hope you get a husband who eats non-veg, then you'll have no choice but to eat it..." (seriously.) I have made my views on the ethics of meat eating plenty clear before - it's a personal choice, we all have a limit to what we consider moral. Where we draw a line... Some people put their foot down at eating dog meat, some are vegetarian, and others go vegan. My reason is animal rights, I make no excuses, I love animals and cannot bear the thought of eating them. I cannot look the other way when it comes to the cruelties of poultry farming and such. I see myself on an eventual path to veganism, though I am not quite ready yet. I have been a lifelong vegetarian, excepting a short trip to non-vegetarianism in my teenage years; so I do see both sides of the coin and make no claim to any moral high ground. There is no right or wrong, just what each of us is comfortable with. 1. I feel less full after meals. My appetite is on the larger side. Instead of many small meals, which I suppose is the healthier option, I prefer to eat my fill when I do. Luckily for me, veggies don't settle down in the pit of your stomach quite as much as meat. Consequence - I don't get that bursting-at-the-seams feeling after a heavy meal and I seem to digest food quicker. It's also been harder to gain weight, a giant plus because I don't do what I should be doing to lose it. 2. I spend less on food. This is awesome! Vegetarian food, here in India, is considerably cheaper in restaurants than meat or fish. I don't know if this is true for anywhere else in the world where meat is the norm. But so long as I'm here, I save more than a little on fancy lunches and dinners. Less variety for us vegetarians is also not an issue in India. 3. Healthier diet. Now I don't know if veggies are healthier - I have read and heard many contradictory views on this. But there have been two big changes in my diet since my comeback to vegetarian food. A. When I was a kid, I underwent a gall-bladder-removal thing, the permanent effect of which was, simply put, that I can't eat foods too fatty, because I have nowhere to store all the extra (an explanation I received at the age of 8, don't ask for details.) Being a vegetarian, I am able to avoid the aforementioned overly fatty, heavy foods with very little effort. B. I eat way more fibrous food than I used to. Way more! 4. Default thumbs-up from all the aunties and grandmas - Okay, this is a joke. I neither condone the judgments nor am I a vegetarian for religious reasons. 5. It looks prettier. 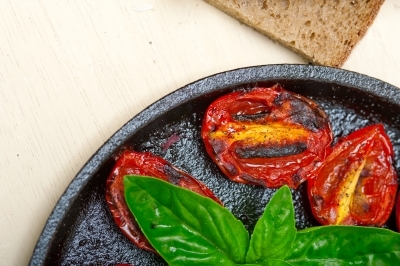 Vegetarian food looks prettier and more vibrant and colourful than a giant slab of meat. It's just a fact. Look at those tomatoes! 6. I feel in control. This is the biggest reason! I befriended someone last year, not from India, who went vegetarian upon making a pact with themselves to give up something that meant a lot to them and learn to live without it. I thought it was the most wonderful thing, because it made me realise just how much this influenced my own dietary choice. I would be lying if I said I don't reminisce the taste of a chicken wing every once in a while - just the taste, without the animal-cruelty-connotations associated with it. I do. But I don't give in to the occasional craving. I don't want to! 'I can guess,' Johnny said. A little while ago, I was telling someone how Stephen King writes more than *just horror. * You know, one of my usual rants. 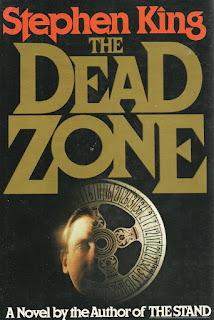 In the foreground of that conversation, I am all the more happy I chose to read The Dead Zone. Published in 1979, it is one of his older books and has that experimental style. I don't know how I missed it for so long. The Dead Zone is about a man named Johnny Smith, who once gets in a life-altering car accident. Johnny is a man who is shown to have possessed a strong sense of intuition since his childhood. But is after he wakes up from a nearly five-year-long coma, that his intuition has blown into a full-fledged clairvoyance. Johnny has sustained unusual brain injuries that may be the cause of his psychic ability. He can sense the past, the future and worm out people's secrets. But there are some things that he can never reach - and these he says lie in a damaged part of his brain which he calls 'the dead zone.' With the help of his ageing father, Herb and his doctor, Sam Weizak, the book follows Johnny as he attempts to lead a normal life in spite of his new extra-normality. Life, however, has other plans for him. Meet Greg Stillson. An aggressive obnoxious salesman-turned-businessman who nurtures an ambition to one day run for President. Avoiding straight answers, making ludicrous promises, loud gestures - these are some of Stillson's specialties. His rallies are led by gangs of bikers for an audience of mindless fanatics. His is a nearly farcical exterior that helps hide the beast underneath. Greg Stillson is a dangerous man masquerading as a joker. The true extent of his breed of terror is revealed to Johnny Smith when he shakes hands with Stillson, and gets a dreadful vision. The Dead Zone is very much about the politics of its time - yet it couldn't be any more relevant in today's world. In fact, look what Stephen King tweeted earlier this year, "Populist demagogues like He Who Must Not Be Named aren't a new thing; see THE DEAD ZONE, published 37 years ago." King does not let you take the driver's seat in this story. You cannot guess what will happen, I don't think you are supposed to. The Dead Zone is as unpredictable and meandering as real life. It is at once a murder mystery, a horror story, a family saga, a political thriller, a psychological drama and a blossoming love story. It is all of these and none of these. Its characters are its lifeline, not its plot. At its core, it is simply the story of a man dealing with what life throws his way and trying to make the best out of it. A good man who has been dealt a bad hand. It is a story of redemption and forgiveness, it is a story that makes you love its simplicity, until it goes and shocks the hell out of you. You looked at the ornaments and remembered that just the two of you had been around to put them up this year, just the two of you because your mother went crazy and then she died, but the fragile Christmas tree ornaments were still here, still hanging around to decorate another tree taken from the small back woodlot. Sure, that's right, God's a real prince. God's a real sport. He's such a sport that he fixed up a funny comic-opera world where a bunch of glass Christmas tree globes could outlive you. Neat world, and a really first-class God in charge of it." I mentioned an experimental style before... The book has a strange narrative flow. An unreliable narrator we don't know we have until the story begins to sound like an unfinished puzzle. We have letters and newspaper clippings and a chunk of story shoved into a mind-blowing epilogue. Surprises, surprises, so many of them. His writing breaks all the norms and so well, it makes you wonder why there are any rules at all. Recently I saw an interview with Stephen King where he said something to the effect that he doesn't want people to read his books for their language, or their message or whatever. What he wants is to just reach out and grab his reader. He did, here. He always has.